How African Is North Africa? The African Cup of Nations kicks off in Tunisia, with 16 nations taking part — and all eyes on the continent are looking north. Seen from space, Africa is one huge and undivided landmass. But for some on the continent, however, the widely-held perception is of two very different regions; Africa south of the Sahara desert, or sub-Saharan Africa, and north Africa. For some, the dividing line is more than the Sahara — it is culture, language and even skin tone. North Africa is predominantly Arab and relatively more developed. Many residents identify more with the Middle East than they do with the larger part of the continent. Hundreds of people from the south migrate to the north in search of greener pastures — but they are often met with hostility. But when it comes to an African identity, some sub-Saharan Africans believe they have more claim to the continent than their northern counterparts. On the other hand, the formation of the African Union in 2002 was a great leap forward in the effort to drive forward common action throughout the continent. And issues that are crippling the continent are just as relevant in the north as the south — Egypt and Libya are suffering from greatly increased rates of HIV and Aids, just as Southern Africa is. On the BBC's Africa Live Programme on Wednesday, we ask just how African is north Africa? Does culture and language link the region more to the Arab world, or should geography be the deciding factor? Imazighen (Berbers and Tuaregs) of Africa have maintained a distinct African culture from prehistoric times to the present-day. The presence of our people in Africa since prehistory is often denied by some sub-Saharan Africans. Yet, we are over thirty million today. We still speak our language and preserve our millennia-old alphabet, the Tifinagh. We have maintained our non-Arabic traditions. Imazighen means "Free Human Beings." We live in Libya, Tunisia, Algeria, Morocco, the Sahara, Niger, Mali and Burkina-Faso. The name Africa comes from our language. I think many of you are mixing up two things about North Africa. 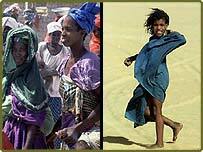 The Arabs are not African in the sense that the Berbers are. Man people from Kabyle region (Berber region) have been killed in Algeria because of their "African" identity. The word "Africa" in Roman times referred only to Tunisia and western Algeria; only later was it extended to encompass the whole continent. Even the word is said to originally come from Berber. So if you want to be pedantic, you can claim a Namibian or an Ethiopian isn't African — but don't try to tell me that an Algerian isn't! Who cares if North Africans identify more with the Middle East than sub-Saharan Africa? They are certainly closer to the Middle East in terms of culture than to black Africa. Besides identifying with us does not solve any of our myriad of problems. It is time for sub-Saharan countries to abandon this pan-African nonsense and face the task of building their respective countries. As someone who is ethnically Egyptian, I do not consider myself "African". To me, that term has too many racial connotations. Egyptians, as well as other North Africans, are racially Caucasian, and that needs to be acknowledged. I personally favour making the Middle East its own geographic entity. A continent stretching from Morocco to Pakistan would have very similar racial or ethnic populations. However, I believe Africa is important to Egypt, if not only for the precious River Nile. Egyptians, however, are first and foremost Mediterranean or Arabs, depending on which you prefer. I'd go with the former.